One of the tourist attractions that caught my attention was the Firefly watching. I read reviews and asked my friend who already went there about this. She said, the ambiance is so romantic. to bring us to the Firefly watching site. Firefly watching site is located in Iwahig River of Firefly-Watching Ecotourism and Wildlife Park in Iwahig, Puerto Princesa. 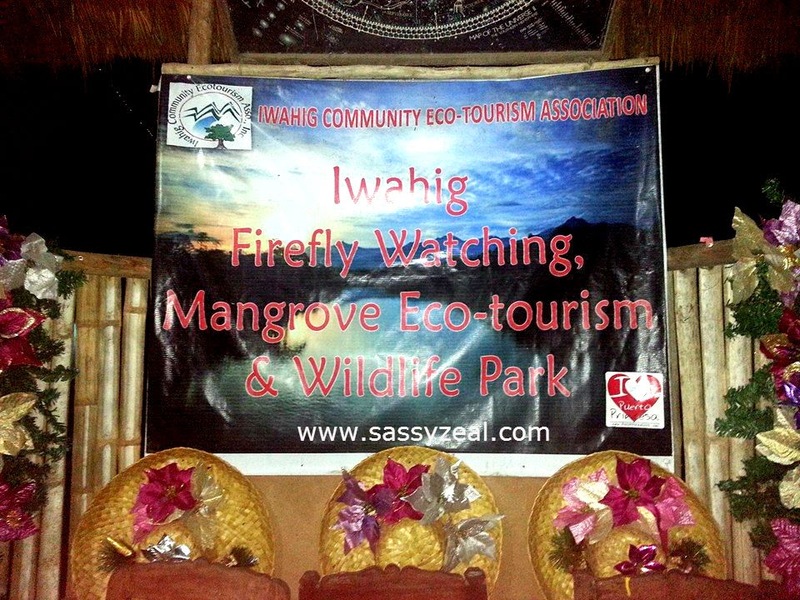 It is being managed by Iwahig Community Ecotourism Association, Inc or ICETA which was established by ABS-CBN Foundation, Inc. and the Puerto Princesa government and Tourism Department. The simplicity of the plain river on the dark night is what we can see upon arriving in Firefly watching Ecotourism and Wildlife Park. Only the tiny sounds of fireflies are what we can hear on the surroundings. It was actually raining and only the four of us were the visitors that night. We proceeded to the registration and entrance payment area. Identification Card is required for recording purposes. We paid P 600.00 per boat. Since the boat can only accommodate maximum of 3 visitors + 1 boatman, we divided ourselves into two boats. We paid a total P 1,200.00 for two boats for the four of us. They provided us raincoat and umbrella and put on our life vests before riding the boat. Then Pastor and Ate Aiza rode on the other boat, while me and Miel rode on the next boat with two boat man. I was scared at first thinking that in that deep and dark river there are crocodiles and mumu (ghost). The deepest part of Iwahig River is 60 feet deep. Then the boatmen started their spiels (facts about the Iwahig River and Fireflies). It made me glad to know that somehow, this tourist spot provided a living for some of the residence of Iwahig like our dear Kuya Bankeros (boatmen) and the fact that they (the boatmen) provided us insights and shared their experience about the Iwahig River and the treasures of it like the fireflies. They were humorous enough to help us restore our confidence under a dark sky and calm floating motion. I was not able to capture those little creatures because, One – I don’t have a high quality dslr flash to capture the camera shy fireflies. Two – fireflies are sensitive to lights. Fireflies are plenteous during December to February. Since it was raining, it was very hard to see fireflies. Kuya Jhon-Jhon (one of the boatmen) was pointing his red laser light to the mangroves which have fireflies. He really knew where among the mangroves fireflies usually dwell. The boat men brought us to the center point of the river where there were mangroves surrounded us with brilliantly shining fireflies under a perfect sky with constellation. It seems that in a middle of a dark night, we were lighted by a spotlight and the blinking little lights being emitted by fireflies and stars in formation above. In a discreet moment, Miel opened his purpose by saying “Kuya,may sasabihin lang ako” (He was talking to the boatmen, “I need to say something”) Then he faced me and showed me a bracelet. Good thing that was a bracelet or else, I might think that it was a proposal if he showed me a ring. Then he said, "I want you to be my girlfriend again” It was a very long story, so just don’t be confused. In short, that was our renewal of commitment to each other. Even though I can’t show and explain to you how romantic it was, just believe me IT WAS REALLY ROMANTIC. Then after our moment, Kuya bankero said that there were also couples like us who become engaged in that point of the river. He cited numbers of couple which I forgot already. So that means, this place is also a romantic place to propose. So sad I was not able to provide you photos. Fireflies are indicator of a balanced ecosystem. Their presence indicates that the place is still healthy to live in. Fireflies are responsive to color red. Male fireflies use their bioluminescence (bioluminescence is the emission of light)to attract female firefly. Boatmen discussed about the Nilad or Nila or the Yamstick Mangrove. The name Nilad was derived from the City “Maynila” where there was abundant Yamstick Mangrove specifically in Pasig River Banks during pre-spanish era. As the year passed, Pasig River was becoming populated which caused the loss of Nilad. Good thing is that, there are still living Nilad in Iwahig where the fireflies are dwelling. Rent a tricycle that will bring you from Puerto Princesa City Proper to Ihawig Firefly Watching. Rent a Van a tricycle that will bring you from Puerto Princesa City Proper to Ihawig Firefly Watching. In our case, we were four and we rented a van for P 1,500.00. For Van rental, please refer here: Cheaper way to explore Puerto Princesa, Palawan. We paid P 600.00 per boat. Since the boat can only accommodate maximum of 3 visitors + 1 boatman, we divided ourselves into two boats. We paid a total P 1,200.00 for two boats for the four of us. 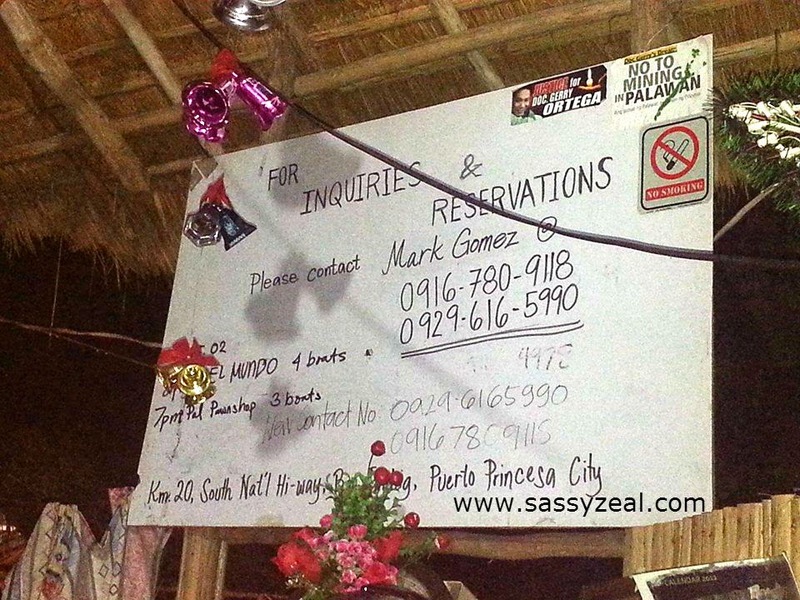 For Cheaper way to explore Puerto Princesa, Palawan, you may also opt to contact the Van we rented on that link. Take note of the Tips and Enjoy! All I want is to share, to inspire, be sassy and to be zealous.